“Wisdom is the balance between knowledge and doubt.” It’s not often that product managers are encouraged to actively question their confidence in their own product ideas. But doubt is exactly what product managers need more of, according to Teresa Torres. Teresa is a product coach who helps teams adopt user-centered, hypothesis-driven product development practices. On Wednesday, Dec 3rd, she challenged a packed room at the Oshman Jewish Community Center in Palo Alto, CA, to make doubt the center of their product management practice. Reminding the audience that pure confidence in a idea does not make it a successful one, she encouraged everyone to get uncomfortable, to step out of their “coherent stories”, and to challenge core assumptions. We do not know what to build next. We do not know when we can deliver it. Once you’ve acknowledged these truths, it follows that you’ll need to change your methods to be able to deliver great products. Instead of writing ~50-page PRDs, shift to building products iteratively (agile helps here). This allows you to learn and adjust, based on customer feedback and hypothesis testing. For instance, instead of building 10 features only to discover in the end that just 3 work, it’s better to run 10 experiments and then only build the 3 that work. This saves time, resources, and money. So, you see that it’s necessary to experiment at the feature level as well as the value-proposition level. What is the change that you are testing? Be very specific about what your expectations are and what you want to learn from the change. What impact do you expect the change to have? The expected impact should clearly define what you expect to see as a result of making the change. Be clear ahead of time with what measures you will use to gauge success. On whom do you expect it to have the most impact? Only test your hypothesis on those that you want and expect to impact. How much of an impact is needed to be successful? For instance, if you need a 25% conversion rate and your tests show you’ll only reach 19% conversion, then you cannot claim success. How long is the testing window? Your testing window cannot be arbitrary, or you might be fooled by false positives. Specify your test duration before you begin your testing and stick to it. Did you estimate your targets based on something specific? Did you use a duration calculator? These are the first steps toward successful hypothesis experiments, and ultimately toward more successful products. April’s SVPMA speaker was author and executive coach Senia Maymin. Senia outlined and taught three tools that we can apply right away to increase productivity in both our professional and personal lives. High tech companies – just like people – are often are trying to reinvent themselves, and often the change is seen as necessary to stay relevant in the marketplace. What areas should we invest in, how much should we invest and how does this align with our strategy? Within each area, which specific investments should we choose? How can we best innovate and bring them to market? Once an offering is in the market, should we enhance, maintain or sunset it? To tackle Question 1. What areas should we invest in, how much should we invest and how does this align with our strategy? 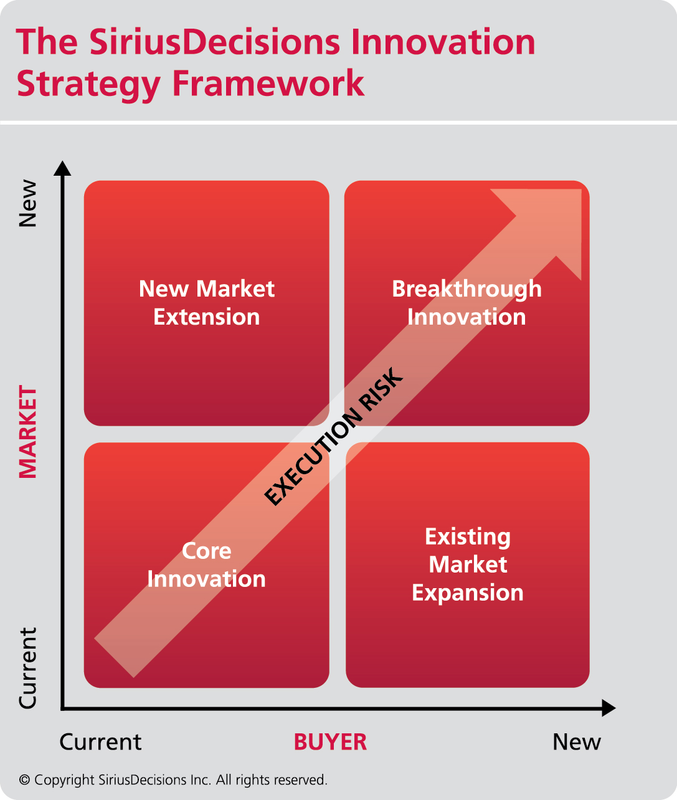 He introduced us to the Sirius Decisions Innovations Strategy Framework. from a current and new Markets (Industry, Geography, Company Size), and current and new Buyers (Buyers’ Persona, Line of business, Budget Line) view. Once you define markets and buyers, you are ready to map potential product investment opportunities based on quadrant and size; but at this point don’t evaluate or rule any out. Jeff emphasized that identifying where your products map to this framework helps clarify what is feasible and reveals potential gaps. Done right, market opportunity identification should guide investment allocation across innovation types based on growth potential. So that leads us to question 2. Within each area, which specific investments should we choose? Now that you’ve selected prospective new product initiatives, the challenge is answering question 3. How can we best innovate and bring them to market? A common mistake many companies make is not coordinating their investments in developing and enhancing products with their marketing and sales budgets. But best-in-class companies proactively evaluate and approve the full investment required to build, launch and support the product. Once the product exists over time in the market (that’s why we call it a product lifecycle), question 4. Should we enhance, maintain or sunset it? needs to be addressed. By looking at the product through strategic, financial, market and commercial lenses you see if the product continues to: Align with corporate strategy, meet financial KPIs, satisfy buyers’ needs and achieve profitability goals.